Surrounded by snow dusted mountains 21 slender white columns suspend a crescent shaped viaduct 30 meters above the river Finnan, but nothing can match the majesty of soaring over it abroad the Harry Potter train. The Jacobite steam train clatters the ‘iron road to the Isles’ through one of Europe’s empitest landscapes, all moorland, snow capped mountains and lake bottomed glens. 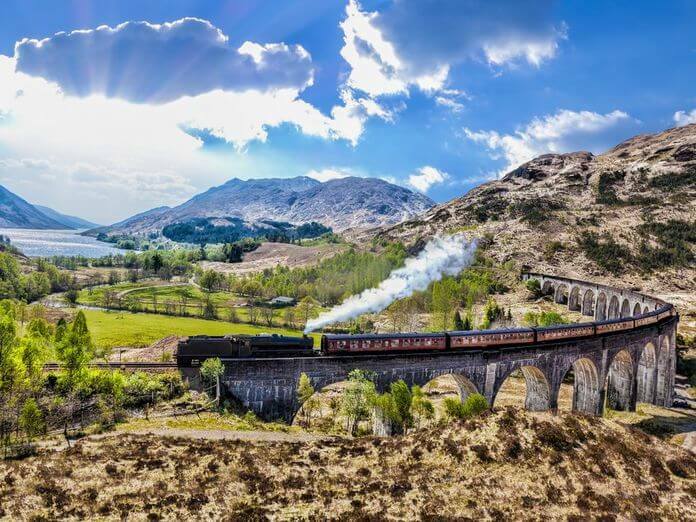 400,000 visitors enjoy this Highland mountain-scape each year, it regularly features on lists of the world’s greatest railway journeys and the Scotsman newspaper rates the viaduct the number one place in Scotland for Harry Potter fans to propose. The train even has it's own tune. Alison, was unimpressed, saying the structure is "just a big, ugly Harry Potter bridge". Judette from Portugal agrees, saying the bridge was deceptive and "looked bigger in Harry Potter"
The monumental effect can be won by climbing up beside the track, or by gazing along the curve of 21 arches decently up to one side of the river Finnan below. It’s the crescent sweep of track or arches which beguile the eye, rather than walking betwixt the concrete piers. The viaduct is grey with a sooty parapet so it pops in low-slung sunshine or at sunrise or sunset, lit amber by God’s own love. So point your wand at the sun and cry ‘Lumos Maxima’. The path to the station, across burns and uphill, with the bridge playing peekaboo through the scrub is what romanced me. Things are often better with a little effort. 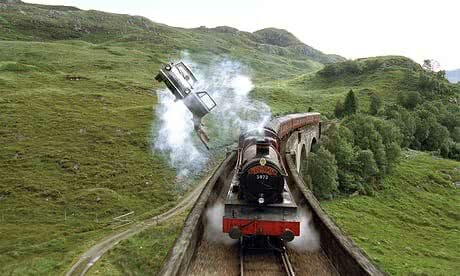 The Hogwarts Express has been loaned to Warner Brothers studio in London. The Jacobite steam engine is it's sister, it's black with red buffers and piping. If it has steam coming from it, that's the school on their way. I’m Sam a Harry Potter tour guide of Edinburgh. This is my guide to my favourite Harry Potter filming location. Including: the film's great fire, the history of the bridge & area, the activities nearby and how to get there. Robert McAlpine left school at 10 and went down a mine becoming a coal miner. He then became a bricklayer, and at 22 formed his own construction company Sir Robert McAlpine, which continues as a major employer to this day. The Fort William to Mallaig extension line begun in 1897 was the firm’s most famous. But his ambition may have over-reached. 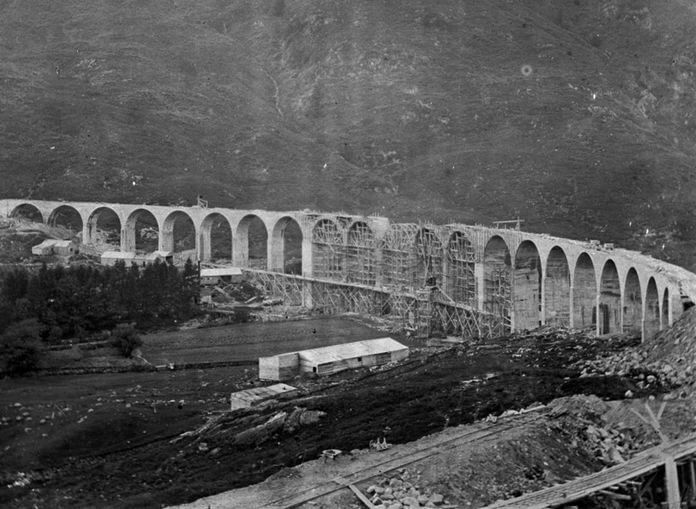 Glenfinnan viaduct was originally planned to be built from local rock, ‘mica schist’, but that was too hard and difficult to cut to a smooth finish. Trained as a bricklayer, "Aha", said McAlpine, "We’ll use concrete". The longest concrete bridge at the time was Borrodale viaduct at 38.9 meters. McAlpine needed to span 380 meters, and not even on the straight, a crescent. The hardest part was carving through the hard rock on the shoulder of each hill, so the viaduct didn’t need to be built even higher, new pressurised water boring techniques had to be employed. At 380m it was then the longest concrete bridge in the world and it remains the longest concrete rail bridge in Scotland. Accounting for inflation today it would cost £2¼ million. Thanks to his trail blazing use of concrete Robert McAlpine became known as ‘Concrete Bob’. On February 22nd 2003 Warner Brothers had been driving the Hogwarts Express backwards and forwards over Glenfinnan viaduct all morning when sparks from the train’s funnel alighted the heath. There had been no rain for 10 days and the fire quickly raged across 100 acres of heather. 4 Highland fire crews rushed to the scene and marvelled, they said it was “absolutely spectacular, it looked like the whole hillside was up in flames”; it was the largest fire they’d ever seen. So they summoned a helicopter to bomb the blaze with water. The copter’s round trip was too slow and the fire reached into a forestry plantation and made it kindle. At one point the fire raged along a one mile front, and the local residents had to be evacuated. The Scotsman called it “Harry Potter and the Fields of Fire”. The filmmaking was, of course, paused for the firefight. The estate lodged a claim of £100,000 with the film’s insurers to replace the young trees. But this wasn’t the end of the production’s difficulties. In April near Torren, in Highland Argyll the crew constructed a hexagonal hut, a garden with a sundial center piece and a spooky staircase through the ‘archway to nowhere’, and a huge turreted gatehouse surrounded by polystyrene blocks. But then a coachload of walkers who’d just completed the West Highland way diverted for a glimpse of the set and it got robbed. Walkers were scrambling over the set, vaulting over boulders and running off with polystyrene blocks. The coach was like the Knight bus, Warner Brothers’ production staff had never seen something move sooo fast in their lives. Scotland was always the spiritual home of the books with Goblet Of Fire the movies came home. Filming the Great lake challenge over the Loch Shiel in the Highlands made it the most Scottish of the Harry Potter movies. With Loch Morar, also passed by the Harry Potter train, used for close up shots. 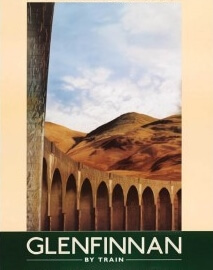 Many other locations were used, Glenfinnan viaduct amongst them. "I see no reason to suppose that these machines will ever force themselves into general use"
Clearly a man who didn’t ace divination. Before railway travel Muggle transport was by road, canals or ships hopping from port to port. Everything was highly affected by the weather, journeys took days or weeks. Railways made everything faster. 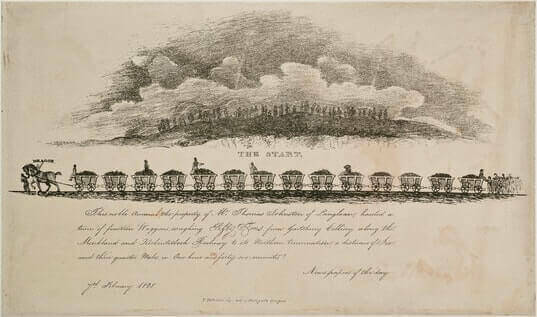 They began to take off in the 1820s for the transport of goods but Scotland pushed back. In 1828 the Monkland Railway conducted trials to see how heavy a train could be hauled by a horse. A big Clydesdale horse called “Dragon” pulled a train of 14 loaded coal wagons, weighing 45,400 kg (45 tons), for seven miles. The journey took 1 hour 40 minutes with Dragon steaming heavily. Horse-power was cooked. In 1692 the British wizarding community had committed itself to the International statute of secrecy, but at the start of every new year at Hogwarts the skies above Britain were full of broomsticks, carpets and Thestrals, cauldrons dangling from them, flying North. Nothing went unnoticed, it was a total nightmare. Where exactly the Hogwarts Express came from has never been conclusively proven, although it is a fact that there are secret records at the Ministry of Magic detailing a mass operation involving one hundred and sixty-seven Memory Charms and the largest ever mass Concealment Charm performed in Britain. The morning after these alleged crimes, a gleaming scarlet steam engine and carriages astounded the villagers of Hogsmeade (who had also not realised they had a railway station), while several bemused Muggle railway workers down in Crewe spent the rest of the year grappling with the uncomfortable feeling that they had mislaid something important. For us, like the Muggles, the magically smooth and fast railways made passage safer, no thunderstorms to skirt as we broom up North. On the edge of Loch Shiel is an 18m high tribute to those who fought in the Jacobite uprising. It stands on the point where Bonnie (pretty) Prince Charlie, of the exiled Stuart kings, landing in Scotland in 1745. He raised his standard here mustering a Highland rebellion. In July of 1745 Bonnie Prince Charlie landed here, gathered troops and proceeded to steam roller over the British army, at the battle of Prestonpans. In September he was outside Edinburgh. Our councillors visited him asking for peace, they would have none of it. So on Sepetember the 17th the councillor returned and the Jacobites swept through the city gates right behind him. 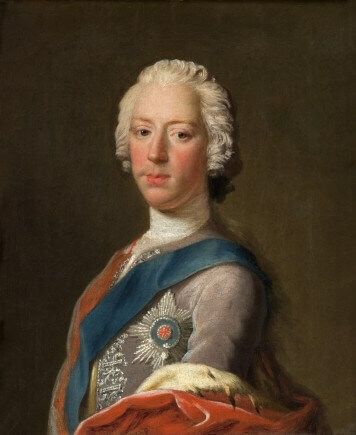 England smashing Bonnie Prince Charlie is in full bonnie bloom and copies were distibruted throughout Scotland as properganda posters. His precious headstart on the disorganised English was being squandered, and at the end of October, weather atrocious, the Jacobite army marched down to conquer England. By December they had made it all the way down to Derby, 120 miles outside London. The city was in a mass panic and people there began withdrawing money from the banks while the King was preparing to flee. Charlie could feel the English heart beating in his hand and was all for pressing on but Charlie’s Scottish Lords were torn, they had reached so far and accomplished so much, but there were 4500 and a 7000 strong English army guarded London. Charlie had led them to believe there would by English support even French, and there none. Legend has it Dudley Bradstreet a government spy arrived and briefed the Scottish Lord’s about a 9000 strong force at Northampton, there wasn’t, but this tipped the uncertain Lords into retreat to the Highlands. Where they were finally defeated at Culloden. 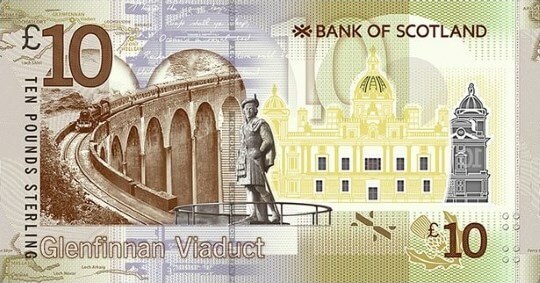 The monument is topped with an anonymous highlander who died for Charlie’s cause (see pic). In 1897 Highlanders had feared a bridge built entirely from concrete would spoil the landscape around Glenfinnan monument. Rich brown wood panelling, lush navy blue seats with white head rests and matching carpet, curtains tied with a bow. One thing however isn’t authentic. The toilets. They’re clean! It serves light lunches in a special setting and is beloved by Tripadvisor. For evening meals book the dinning car. A charming museum about the engineering of the bridge and the setbacks faced. The Jacobite steam train actually pauses at the station for people to enjoy the museum. My favourite thing is the railway posters. You can buy postcards of them at the museum, attach them to the feet of an owl and they’re like skis. Sleep in a ye-olde railway car. Sleeps upto ten. A bunk can be hired from £15. 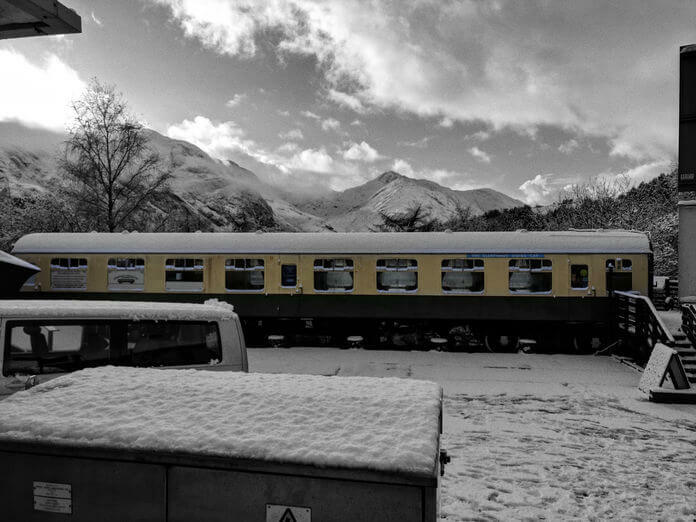 If you want to do some hiking around Glenfinnan the sleeping car is perfect. The Jacobite steam engine had to brake near Glenfinnan station after the driver spotted two old women standing beside the line. And on the same journey the driver had to file a report about a man with a tripod set up amidst the tracks diving aside, the poor driver must have nearly had heart failure. 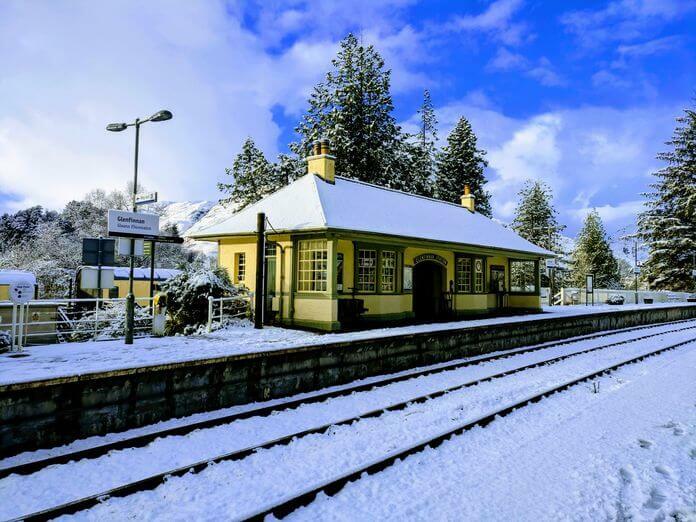 British Transport police have been doing their nut, in 2017 there was a 16% increase in railway trespassing, as Harry Potter fans disembark the Jacobite steam train at Glenfinnan station and walk directly back down the tracks to the viaduct in the face of incoming trains! The Police are warning visitors ‘look you’re mere Muggles [ you’re not going to be able to stupify a 300 ton steam train ], if you trespass on the railway and are struck by a train, the consequences could be extremely serious and probably fatal’. Building Glenfinnan viaduct using whole new processes was not without it stresses and legend has it a horse backed up it’s wagon to pour rubble into one of the hollow piers supporting the bridge. It was led back a step too far, the cart fell backward into the pier, dragging the horse down with it, a 30 meter drop. There was no time for winching the broken horse out, so more rubble was simply poured on top. In 1987 Professor Roland Paxton drilled boreholes in the only 2 piers large enough to admit a horse and inserted fisheye cameras into them. No evidence was found. On the basis of gossip from Glenfinnan hamlet he tried the same at Loch nan Uamh Viaduct further along the rail line, to the same result, it was just full of rubble. Were they pulling the Fred and George? In 2001 Professor Paxton tried again. 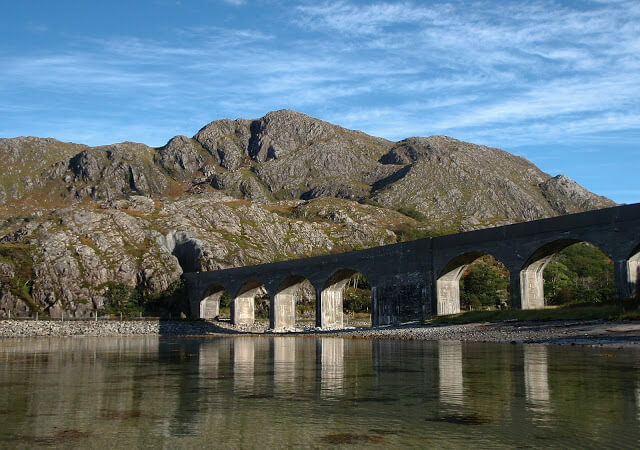 The large central pylon of Loch nan Uamh Viaduct was investigated using X-rays, transmitted through walls 3 meters thick, many hours were spent interpreting the results. A plaque from Sir William McAlpine was unveiled correcting the legend and vindicating the professor’s dedication and determination. 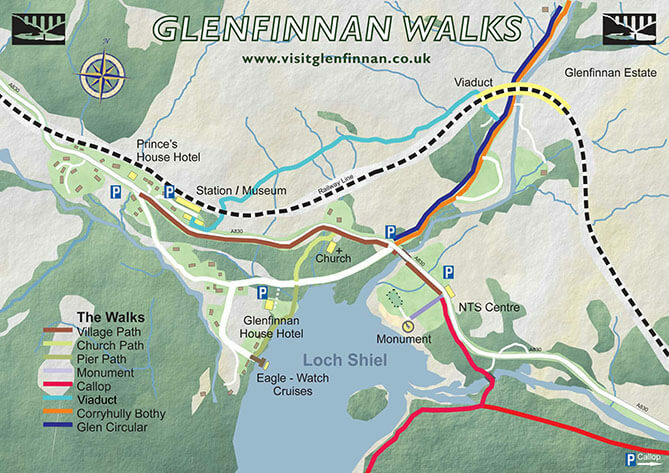 Glenfinnan is a 30 minute drive from Fort William. The sight is popular, it can take some time to get parked so please allow for this. The true beauty of Loch shiel is the landscape so arriving early lets you drink this in. There are 2 carparks, one which is often full for the monument, another for the hiking paths up to the viaduct. Parking here is £2. Don't drive into the private road at the back of the car park. Park and follow the trail out of the back of the car park which branches off to the left. Glenfinnan viewpoint from the Monument's carpark takes about 10 minutes to climb to the same height as the track. As of March 2018 be at the Glenfinnan Visitor Centre by 10.55 am or 3.00pm to see the cream of their generation heading to the finest school of witchcraft and wizardry steaming across the viaduct. 145 miles away, about 48 hours walking, are my Harry Potter tours. You could always Apparate. 520 miles away is King's Cross station, where the Hogwart's Express departs from platform 9¾. Takes it about 9½ hours to Glenfinnan. Glenfinnan station museum kindly provided some of the images. 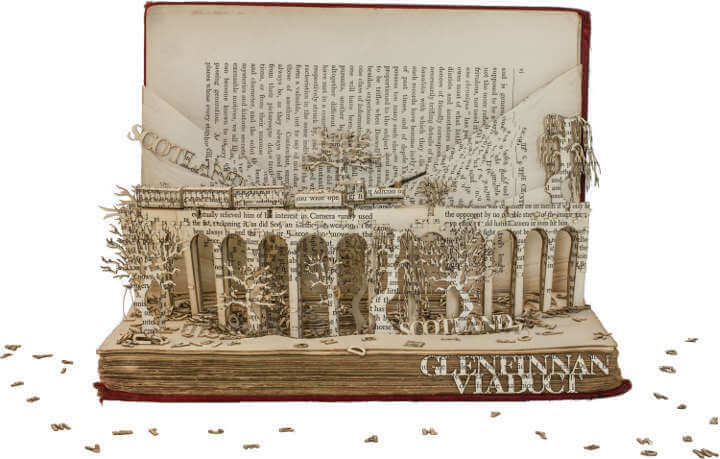 Book sculpture by Thomas Wightman.